Castercliff is an Iron Age multivallate hillfort situated close to the towns of Nelson and Colne in Lancashire, Northern England. The site consists of three ramparts enclosing an oval interior. Excavations during the 1970s appear to show that the site was not completed, and no evidence of occupation was unearthed. The site is a Scheduled Ancient Monument. 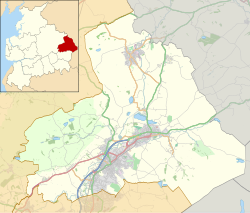 ^ Lancashire County Council Archived 2011-06-13 at the Wayback Machine. Wikimedia Commons has media related to Castercliff Camp.